The City of Fayetteville provides services to over 200,000 residents throughout the area. Located in the southern region of North Carolina, Fayetteville neighbors the renowned Fort Bragg U.S. Army Base, the largest military installation in the world. The city has been an avid user of Cityworks AMS and PLL since their implementation in 2014. In particular, the city uses Cityworks PLL to manage code enforcement cases. As the city grew, it became clear that code enforcement officers needed a mobile solution in the field that allowed them to create cases. As a result, Timmons Group worked with the city to develop a mobile app for iOS and Android users that streamlined two workflows: case creation and follow-up investigations. 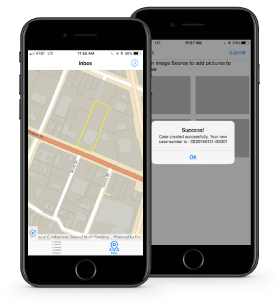 The mobile application allows a user to select a location from a map, select a code enforcement case type, add in critical details, notes, and pictures from a mobile device, and ultimately create a case in Cityworks PLL. Leveraging the city’s map services, users can zoom to their location or navigate on a map to specify the location of a code enforcement issue. The user can then select a case type and complete custom fields the city identified as required at case creation. Once that information is selected, the user can add any comments or notes and upload pictures. A follow-up investigation is even simpler—the mobile application contains Inbox functionality so that mobile users only see work of interest to them. At that point, they can select the task, assign a result code, and attach any comments and additional pictures. The mobile application has streamlined the inspectors’ daily workload. Prior to the mobile application, preparing for the day would require the city’s inspectors to log in to their laptop for daily assignments. Any new items found on inspections required inspectors to use a notepad to write down everything, then stop early enough to transfer their notes into Cityworks. The mobile application eliminates the need to log in or download assignments. The application also eliminates the paper log and allows more time for inspections by creating a case with most of the data to include up to four pictures. An unexpected added feature is the ability to update current cases. The application is always improving based on input from the city’s inspectors. Upon successful implementation of the Timmons Group mobile solution for code enforcement, the City of Fayetteville is able to more precisely maintain their code violation cases through a cell phone or tablet while improving efficiencies for city inspectors. Additionally, the existing Cityworks PLL environment, along with the pending portal and desktop tools, is enhancing the capability of city staff to manage permits, inspections, and code enforcement violations in the city with over 100 case types developed inside the Cityworks software.